If you’ve been putting off a roof replacement, now is the time to take action. As many roofers and home improvement experts know, fall is the best time of the year to tackle a reroofing project. In this blog, we are going to look at some of the reasons why. At Tim Leeper Roofing, we are more than ready to replace the roof on your home or commercial space. However, before you schedule a roof replacement, it is important to have a local contractor—someone you trust and who has your best interest in mind—confirm that your roof is, indeed, beyond repair. If you would like Nashville’s Top Rated® Local Roofers to perform this inspection, we would be more than happy to do it. Get your speedy fast quote here! Read on to learn about why the cool days between September and November are perfect for adding a new roof to your home. Roof work is a difficult job. In addition to the danger of being on top of a roof, the weather is also hugely influential to the overall safety, the difficulty of the job, and the time it takes to complete the replacement. In a temperate climate, like we have here in Nashville, fall temperatures typically fluctuate between 45 to 80 degrees. This is an ideal temperature for being on top of a home replacing a roof—it’s not oppressively hot or cold. If your roof is beyond repair, you want to get it fixed before winter—as we mentioned, call your local roofing contractor to ensure it does, in fact, need to be replaced. Even something as small as a leak or tiny hole can become a big ordeal once winter arrives. Though Nashville’s average amount of snowfall (roughly 7 inches) is well below the national average (26 inches), we are still susceptible to an occasional big snow storm. And if this year’s hurricanes are any indication of the winter we have coming, we should probably expect more than an average amount of snow. All it takes is one major snowfall to turn those minor roof problems into personal nightmares. Not only will the moisture from the snow trigger problems but so will the weight of the snow and ice dams. It can exacerbate any issues and even cause structural concerns. When you choose to reroof in the autumn, you’ll be able to improve the efficiency of your heating, which will ultimately lower your heating bills. This is especially true if your HVAC system is located in your attic. When you save on your heating bills, this will help offset the cost of roofing repairs or a replacement. Not only is the fall weather perfect for roofers, but it is also perfect—technically speaking—for shingles. New asphalt shingles do best when the temperature is above 50 degrees. Specifically, this temperature is optimal for thermal sealing—which is the process whereby the shingles’ seal strips melt and adhere because of the ambient warmth. This ensures the creation of a strong, airtight bond that will block moisture and serve as a barrier against winter’s cold. Though most roofers offer discount prices in the winter, the shingles tend to be more brittle and harder to work with during this time. Installing a roof in the winter can result in many broken and wasted shingles. Because of this, roofers may fasten the shingles only using hand nailing rather than using nail guns. Naturally, this can complicate and slow down the job. 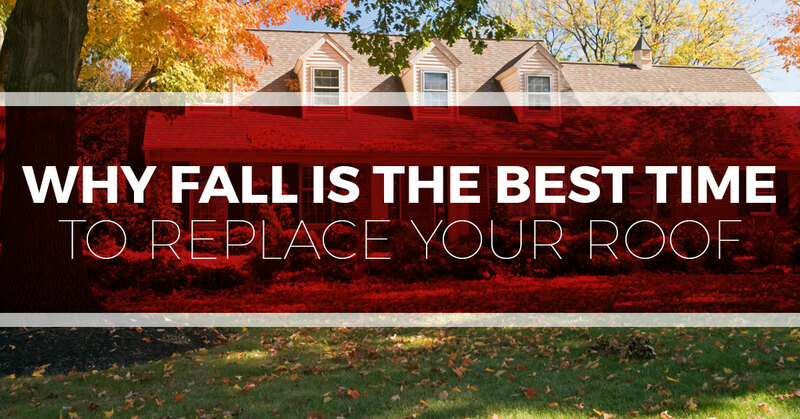 Choosing to replace your roof in the fall is ideal. Not only does it provide the perfect weather conditions, but it will also ensure that your roof will not bring you any trouble in the winter. It’s always better to plan a roof replacement according to your own schedule, rather than begging a roofing contractor to do a rushed, emergency repair or replacement. This will save you both money, time, and a potentially huge headache. When looking for a residential roofing company in Nashville, look no further than Tim Leeper Roofing. We can provide a roofing inspection, evaluate the integrity of your roof, and if needed, we can replace your roof before extreme weather arrives. Contact your local roofing contractors for all of your residential and commercial roofing needs!